Nigeria's Chief of Defence Staff, General Abayomi Gabriel Olonisakin has approved the appointment of Major General Augustine Chris Chukwudi Agundu as the new Commander, Operation Safe Haven, Plateau State. Gen. Agundi takes over from Major General Anthony Atolagbe who has been redeployed to Defence Headquarters and appointed Director of Campaign Planning, an official statement says. Acting Director Defence Information,Defense Headquarters, Abuja takes immediate effect in order to reinvigorate Operation Safe Haven to meet contemporary challenges. 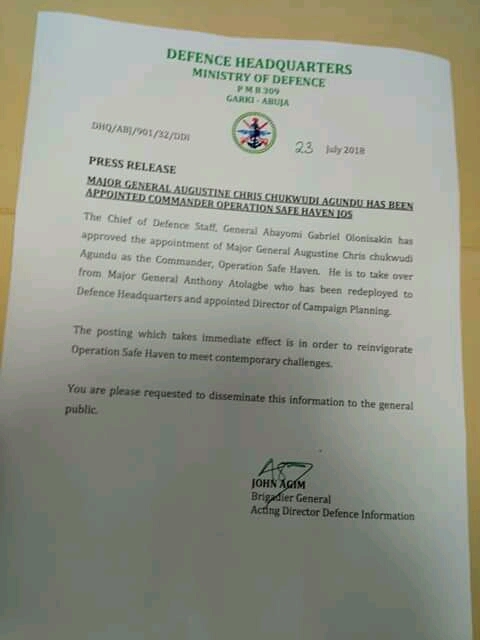 The statement dated July 23, 2018 confirms earlier reports by this medium that some superior powers were planning the removal of Maj. Gen. Atolagbe, the outgoing STF Commander over alleged insubordination. Atolagbe had taken a new stance against armed attackers by relocating to Barkin Ladi town after the June 23 attacks in Northern Plateau which led to the death of over 200 people. His relocation which was followed by the arrest of over 20 herdsmen in connection with the attacks was believed to have angered some super powers in the Presidency who commenced moves for his immediate removal. "Moving to B/Ladi made it hard for him to predicted and monitored, thereby angering the super powers," a Presidency source had reported. Atolagbe is one of the few removed before the official 2year tenure for the Commanders elapsed over alleged insubordination. In Sept. 2015, Major General Tabugbo Ude took over as the 8th Special Task Force Commander (Operation Safe Haven) following the redeployment of senior military officers by the Nigerian Army. General Ude took over from Major General David Enetie who assumed duty as the 7th STF commander on the 9th of September 2013, replacing Maj. Gen. Henry Ayoola. Gen. Ude was replaced by Gen. Rogers Nicholas in July 2016. The appointment of a substantive Commander for the task force followed the retirement of Major General Tagbo Ude in June. Major-General Rogers Nicholas soon handed-over to his successor, Major-General Anthony Atolagbe in August 2017. Major General Henry Ayoola had taken over from Major Gen. Mohammed Ibrahim in May 2012 after serving three months. Gen. Mohammed who assumed duty in February 2012 was redeployed by the then military authorities over complacency. According to The Guardian Newspaper of 12th May, 2012, "Since Gen. Ibrahim assumed office as Commander, a day hardly passed without one attack or the other. "Even when he assumed office on Sunday, February 26, he was greeted by suicide bombers who bombed the Church of Christ in Nigeria (COCIN) the next Sunday." It was under Gen. Mohammed in May 2012 that 500 people were killed in a said military raid in five Southern Plateau villages in Wase LGA. Gen. Mohammed took over from Hassan Umaru under whose watch the Plateau herdsmen attacks began to gain momentum with widespread allegations of military complacency in 2010. He took over from Gen. A.M. Maina, the then GOC and STF Commander in late 2010. It was under Maina that the Dogo Nahawa massacre took place, heralding the first monumental damage caused by herdsmen in Plateau and the Nigerian Middlebelt region. Then Gov. Jang at the time claimed he kept calling the military Commander for intervention during the attacks but he didn't pick up. Gen. Umaru Hassan replaced Maina in 2010, served two years with alleged anomalies in the management of the Plateau crises, leaving in 2012. Major Gen. Mohammed Ibrahim Gen. Mohammed who assumed duty in February 2012 was redeployed in three months under Goodluck Jonathan following alleged highhandedness in the management of security in the state. Major General Henry Ayoola took over from Major Gen. Mohammed Ibrahim in May 2012 and served one year after reportedly improving civil-military relations and subduing attacks in the state. David Enaetie replaced Gen. Ayoola in September 2013, leaving in September 2015 under GEJ. Tabugbo Ude reported in September 2015, and was allegedly forcefully retired in June 2016 after President Buhari took over. Maj. Gen. Nicholas Rogers took over in July 2016 and left in August 2017, exactly one year. Gen. Atolagbe Anthony was deployed in August 2017 and also faces redeployment in one year. It is not known how effective the new STF Commander would be in handling the continued attacks on Plateau native communities. Observers already express fear that he could be complacent given his ethnic nationality which is stereotyped to be money loving. The truth of it however can only be known as time proceeds.